Disclaimer: Some of the links you will find below are affiliate links, meaning that at no additional cost to you, I will earn a commission if you click through and make a purchase. Cookies will be used to track the affiliate links you click. In my quest to master the world of steaks and all the different cuts, I am always keep my eyes peeled for cuts that I have not talked about on this blog before. A last night journey into my local Meijer store, I spotted the Top Sirloin Filet steak. The package came with two steaks on sale for $4.99/pound. I snatched those puppies up and toss them in the freezer until I was ready to use them. In our house I like to save the steaks dinner for later in the evening when the kids are in bed and my wife and I can just enjoy without interruption. Trying to perfectly cook a steak with screaming kids all around you is one of life’s greatest challenges! What is a Top Sirloin Filet Steak? Most people are familiar with the Top Sirloin – a long, tasty steak, that can be found at most steakhouses. It’s one of my favorite steaks to toss under the broiler. It comes from the Short Loin of the cow, which is located toward the middle of the cow’s back. It’s the part of the cow where we get tenderloins, ribeyes, porterhouses, and t-bones. The Top Sirloin Filet steak is a cut of the leanest, most tender part of the top sirloin. 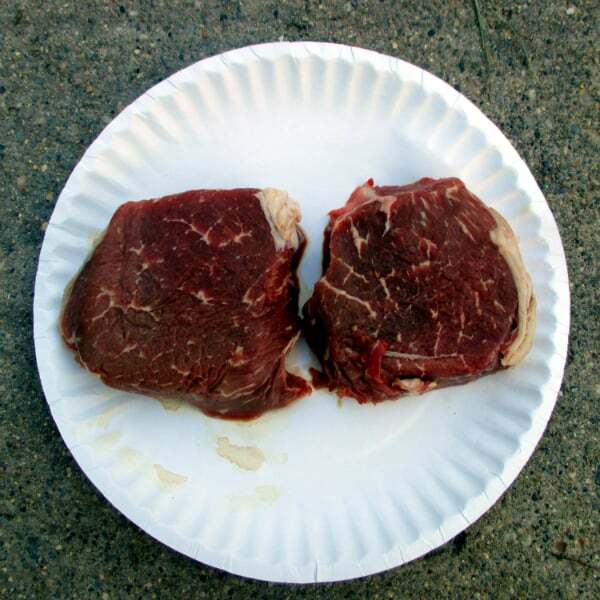 It is bonelness and similar in appearance to a filet mignon without the hefty price tag. It has the flavor you would expect from a top sirloin. The key thing to picking a good steak is look for good streaks of fat in the middle. This is a leaner cut but that doesn’t mean it’s devoid of all fat. Choose steaks with nice steaks in the middle. If they come in a package of two, try to pick ones that are the same size for even cooking. Watch out for sales on top sirloin as you might be able to find the top sirloin filet on sale at the same time too as I did. Cast iron gets nice and hot and distributes the heat well for nice browning on the steaks. hat I recommend doing is performing a quick sear in a cast iron pan or any heavy bottom pan that is oven safe, then finishing it in the oven. 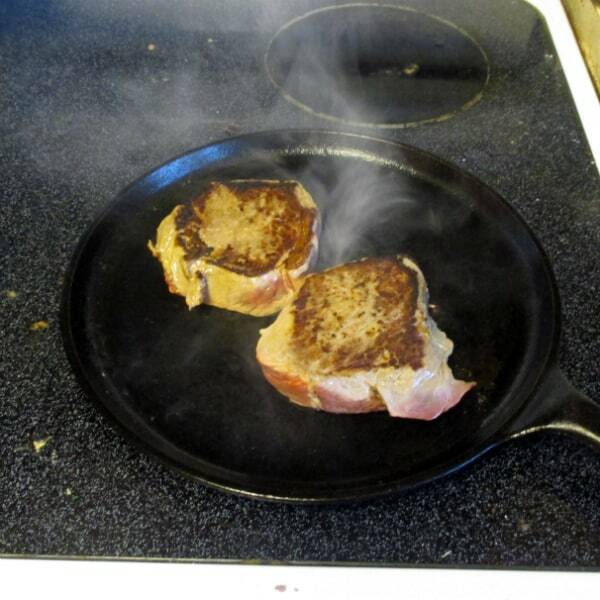 I used a Lodge Cast Iron Griddle, when I last cooked these steaks and it did a wonderful job. I first saw this method performed by Robert Irvine on Food Network’s Restaurant Impossible. By finishing it in a hot oven you can finish the inside without burning the outside. Of course cooking a steak on a grill outdoors is a special thing. Sometimes the weather won’t allow for that. So when cooking a steak indoors I always do it on cast iron. I always recommend the american company Lodge for their cast iron. High quality, American made, and won’t break the bank. Here are 3 different options of cast iron to cook your steak on. Griddle – For small steaks like these ones, a grill works perfectly fine. A grill is always the perfect vessels for hamburgers. Both steaks and burgers are easy to flip on a griddle because the sides are so shallow. Skillet – A skillet will have high sides. Good for making cornbread in. And can be do a steak proud as well. Not as easy to flip as in a griddle but a skillet is more versatile. Grill Pan – If you want those nice grill marks turn to a grill pan. They have ridges that will give you that very appetizing looking grilled appearance. A two part cooking method is the perfect way to cook top sirloin filet steak. Place your steaks on a plate and liberally season with kosher salt. Allow them to come up to room temperature before cooking, about 30 minutes. Coat a cast iron skillet or oven safe pan with a coat of oil. Place over high heat. When hot, place the steaks on leaving room between them. Sear for 2 minutes, then flip and sear for another minute. Immediately place into the oven. Allow 3 to 5 minutes for the steak to finish or until they an internal temperature of 5 degrees below your final temperature (120 for rare, 130 for medium rare, 140 for medium, 150 for medium well and 160 for well done). Allow the steak to rest on a plate for 5 minutes before cutting. Previous Post: « What are Skylar Rae Cherries? I was looking for a way to cook a top sirloin filet and foung your blog. I like how you explain what the cut is and what to look for when purchasing and best ways to cook it. Great job! Came out perfectly! Thanks for the recipe. I am glad to hear it. Thanks for the feedback. This is exactly what I was looking for. My husband says my oven steaks come out rubbery, so I knew I needed to do something differently. I just didn’t know what. I’m trying this out tonight! Is there a good way to use this steak in “Sheet Pan Sesame Beef” oven-cooked broccoli and beef ? I got the meat on sale and need to use it soon. I haven’t cooked sheet pan beef before, but I would say top sirloin filet would work perfectly fine for this. I would cut it into 2 inch pieces and add your other ingredients as planned.